Welcome to April’s Thoth tips, wonderfully hot and sunny here at the moment – really encouraging for the months to come. This months thoth tip concerns one of the Magus cards which some Thoth decks contain. Many people don’t use all three Magus cards in the Thoth deck as it was only ever intended to have the one – the other two were included because there were plates left at the end of printing the rest of the cards so it seemed a shame to waste the opportunity to print a couple more cards. So these two alternative designs were printed along with the rest of the deck. This led to some people thinking about using them – perhaps including the extra two cards would be an interesting thing to do. Gerd Ziegler published some meanings of these two extra cards as he saw them in his books Tarot: Mirror of the Soul and Tarot: Mirror of Your Relationships. So they became an option to use to the wider audience. I myself like to use the two as they become to me ‘yes’ and ‘no’ cards and give very clear answers should they arise in a spread involving options. There are however deeper meanings that can be taken from the two extra cards and this month I am going to look at the White Magus, which is entitled “The Magician”, in some more depth. 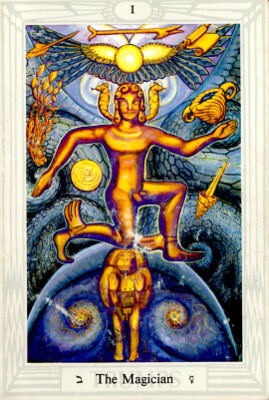 When using all three Magi this card represents communication, creation and all the positive attributes of the Magus. He is someone who has only the Light in mind as he creates the world in front of him. He is honest, open and loving in all things and can allow himself to be very flexible to move the higher picture forward. This is the salesman or woman who will not manipulate you into buying but will still speak openly and positively about the product he or she is selling. And it will be something that has heart and meaning to him or her. Within us this is the light side of ourselves – all that we love and appreciate of our nature and the ability to feel confident that we are good in what we do and how we are in our whole self. In some ways it is the innocent boasting of a child where confidence is there and there is little regard that displaying ourselves will be a danger in any way. And because of this belief, the innocent energy, often things work out very well indeed. However the shadow of this card as even this card has a shadow, is that we can be so busy ‘being good’ whatever that means to us, that we are ignoring our own personal shadow side. This is the side of us that feels angry, or arrogant, or controlling or whatever qualities we would hate to see ourselves as having. The ignoring of our shadow over a long period of time can actually cut us off from reality – both our own reality and how we really feel – “no its ok, I am fine” when actually this is not now the case, and also the reality of the world around us “he could never do that surely” This does then lead us to be vulnerable to others shadows as we draw to us the reflection of what we are ignoring in order to become whole ourselves. There is an opportunity here to reach towards transformation and avert external expression of our shadow in a major way and become more whole in the process. It may be that we have been working so hard to help and look after others we have neglected our own need to be free from being on our best behaviour, perhaps we need to create a holiday, or a metaphorical playpen of some sort, where we can be with friends and let our hair down releasing some of our shadow nature in a safe contained way, with those who love us and accept all sides of us, before we go back to being responsible in our work and professional lives. So perhaps this month you can ask yourself what do you need to create to bring balance to yourself – it might be standing up for yourself in a situation that is not for your highest good, it might be to take some time off your professional role and be yourself, responsible only for your own behaviour and not for the success or otherwise of a project. This card is a positive card overall and doesn’t foretell difficult situations – but it does ask of you to be conscious of darkness while you play in the light so you are not caught unaware when an adjustment to maintain balance is asked for.